The race is on for companies to find big, explorative or even “disruptive” innovation ideas. ‘Disrupt yourself or someone else will’, it has been said. Almost every company shifts into overdrive to create ‘smart’ products, to turn a product business into a service business, to create new business models or to reach out beyond their traditional industry boundary. This race is fueled by shareholder’s and business media’s demands to be ‘more innovative’ as well as by the Digital Transformation tsunami – which already has reshaped some familiar shorelines in several industries. There is a huge noise around what companies should do to find the big ideas. Compared to it, the discussion about the best way of turning those ideas into substantial businesses is almost silent. We think it is high time to change this. Leading companies have invested heavily into more than 300 corporate innovation centers around the globe. Depending on the companies’ objectives, these innovation centers are mostly autonomous, designed as corporate accelerators, incubators, Digital Labs or in a blended form. There is a significant rise in investments into open approaches to innovation such as scouting, listening posts, corporate-university partnerships, technology spin-ins etc. And finally, as has been shown last year, Corporate Venture Capital is re-positioned from a primarily financial instrument towards a major innovation driver. However, there are only few reports that ideas coming out from these approaches really moved the needle. Quite contrary, there is an increasing number of stories showing that prestigious companies, some of them world market leaders, have been shutting down their innovation centers. Geoffrey Moore has pointed out 25 years ago that ‘out there’ is a chasm to be overcome in the market diffusion of non-incremental or disruptive innovations. In our view, to understand the chasm – and hence to increase the business impact from explorative ideas – it is key to recognize that corporate start-ups are fighting a two-front war. Conventional start-ups are fighting on one front ‘only’: They want to win the market and scale their business. However, ‘corporate start-ups’ (in this context defined to be an explorative idea with validated product/market-fit which should be turned into significant business by leveraging corporate assets) are forced to fight additionally on a second, internal front. This second front is the inherent tension between the core organization and the corporate start-up. The tension comes from the largely incompatible designs and operating models of these two organizations, which are based on two completely different rationales. It cannot be avoided – but it can be managed. The business units of the core organization are operators and incremental innovators. They are designed to exploit the opportunities in defined markets, technologies and business models. They are based on lean / efficient and 0-mistakes principles. They are driven by solid, near-term financial goals. They excel at keeping supply chains and factories humming and at managing complex networks of suppliers, distributors and business partners. The core business, however, is not designed to create risky leap-frog, explorative innovation that is incompatible with the existing business system at the outset. Quite contrary, corporate start-ups has an explorative DNA. By definition, they’re designed to look further ahead and explore terrain that is not yet on the corporate map. They are based on agile / lean start-up / test-and-learn principles. They are geared towards long-term (financial) goals. They excel at finding new ecosystem / co-innovation partners and push the innovation agenda into new business models and sometimes even beyond the defined industry boundary. 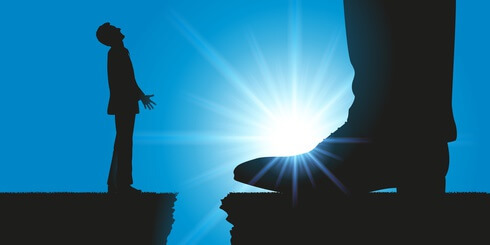 For many companies, transitioning a particular corporate start-up over the chasm, i.e. scaling-up the big idea, is still an art, not a practice. The rare success cases can mostly be ascribed to ideal ad-hoc conditions or to corporate mavericks burning for their ideas so much that they were willing to fight all the conflicts and risk their own career in doing so. After making this distinction it becomes apparent that from a process view the transition between ‘having a validated idea’ and ‘driving business growth from inside the core organization’ is underexposed today (see exhibit 1). Lean Start-Up and customer development helps to understand how to turn these ideas into a business context, including how to build minimum viable offerings, create and develop initial customers and leverage agile iterations. At the other end of the spectrum we find many – too many to mention – methods helping companies to grow an existing revenue base once a solid initial customer base has been established. However, compared to these two phases, there is no comparable body of knowledge for the Scaling-Up phase. This essential transition looks a bit like innovation’s ‘no-man’s land’. There is a second lens that underlines the need for developing a solid Scaling-up-methodology. If one plots the vehicles companies use to win the innovation race (see above) in a portfolio showing the phases and the set-up, one finds that there is a big, open space (see exhibit 2). 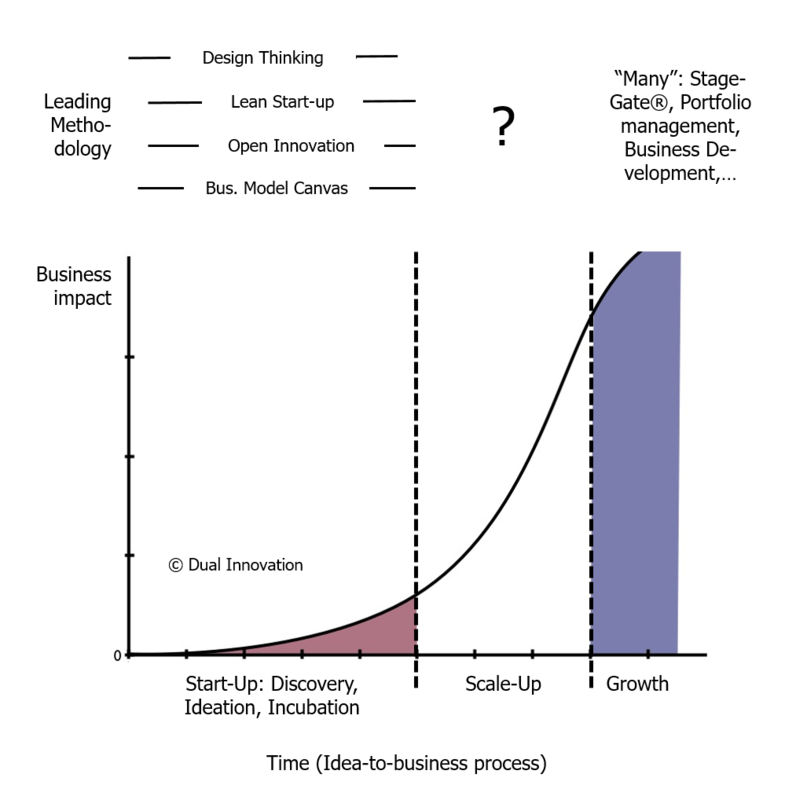 Most of the vehicles used to win the innovation race are focused on the stages Discovery, Ideation and Incubation. Depending on the specific company goals, they are set up in a start-up-setting, in a corporate setting or in a blended form. Our research did not find formally set-up vehicles for Scaling-Up. There are some companies discussing with us how to set up dedicated units for scaling-up – but these are not operative yet. For us and for many companies it becomes apparent that there is a missing piece in corporate innovation and digitization. 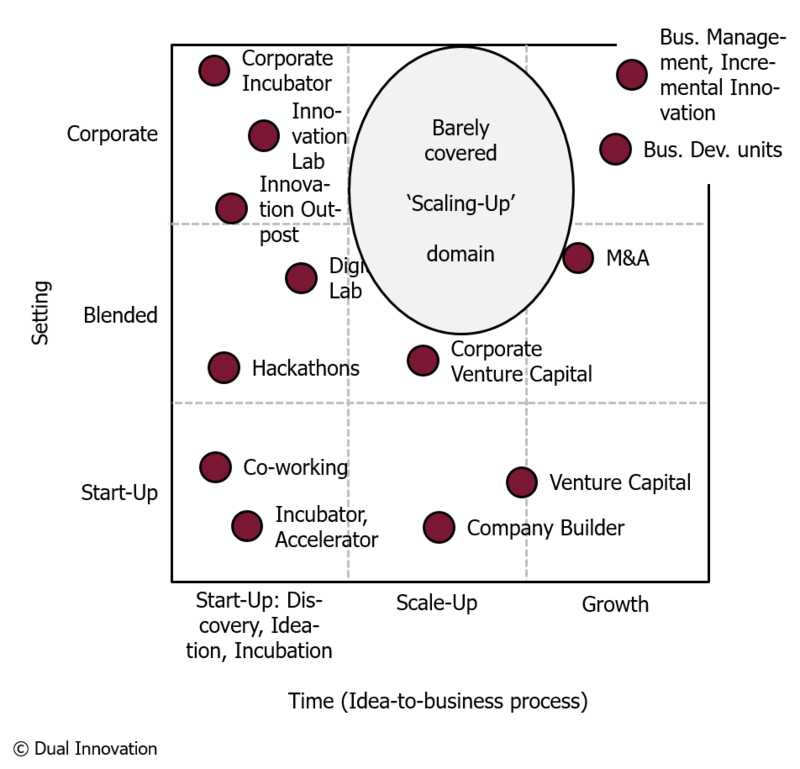 The pivotal area, which features a unique focus on combining scaling-up (vs. ideation/discovery or incubation) of corporate start-ups with corporate (vs. start-up) setting has not been addressed by companies adequately up so far. We expect that there will be a growing focus on a ‘Dual Innovation Management’ that integrates sustaining or incremental with explorative innovation and provides a solid basis for corporate start-ups to scale and become a meaningful business. We found that several companies see the issue that we addressed in this article and aim to be leading in ‘turning Scaling-Up from an art to a practice’. We suggested a process that would produce a framework which allows for navigating in the pivotal point. Work in this Peer Group will start in the next few weeks. If you would like to join this group of fine companies, please drop Frank Mattes or Dr. Ralph-Christian Ohr a line.